Cutting the top of the bulb diffuser off, we can see the LED carrier board. The LEDs are mounted on an aluminum substrate to conduct away the massive heat they generate. The sockets in the middle mate to right angle to pins on the vertically mounted board behind. This makes for easy assembly and is a pretty common way of putting together LED bulbs. There are three different colors of LEDs and the mix of these colors changes throughout the day to generate the desired spectrum. Without the diffuser these LEDs are blindingly bright point sources and I had to use welding goggles to look at them even at the lowest brightness setting. Unscrewing and removing the LED board shows some white thermal paste that helps the heat flow from the back of LED board to the body of the bulb. Here we also get our first glimpse of the main electronics and they are completely encapsulated in some kind of silicone (which GE probably gets great internal pricing on :) ). Next we remove the bottom screw cap which is tightly crimped on. The two mains wires feed though a hole in the bottom that is also sealed with silicone. I wonder why they are doing so much work to seal up the electronics? Is it to keep water out.. or electricity in? If you know why, please do tell in the comments! Once the bottom wires are freed, the electronics module slides out neatly, leaving the bulb body. A little sandpaper reveals that it is a sold piece of cast aluminum. This massive heat sink helps to keep the LEDs from overheating, and gives the bulb a very hefty and solid feel. The white coating seems a little harder to remove than regular paint. Maybe it is a baked on enamel? The now free electronics assembly has white plastic cladding wrapped around it. Seems like the main board could have slid directly into slots in the body housing and been potted in place there, saving the extra plastic material and a step. Maybe they wanted a belt-and-suspenders insulation barrier between the internals and the electrically conductive bulb body? Comments please! The plastic cladding comes off easily leaving nothing but a giant chunk of potting between us and the guts! Here is a nice view of top side showing the pins that mate to the LED carrier board. That white surrender-flag sticking up is the Bluetooth antenna. It pokes though a hole in the LED board so it can have a clear radio view of the world rather than being trapped in what is effectively a Faraday cage formed by the bulb’s aluminum body and LED board. Really nice design. I wonder if having everything all the electronics sealed inside aluminum helps with EM emissions compliance? It is not too hard to coax the silicone off in big pieces with an X-acto and tweezers. Here we see the electronics module consists of two boards mounted at right angles to each other. The main board is a pretty typical power supply and is manufactured with low tolerance traces and big 0603+ and SIOC parts. Here I plugged the LED board back in to the top pins to show the assembled geometry. That neat row of pins protruding along the center come from the digital draughtboard mounted on the back. side. The pins are though-hole soldered in place. I wonder what process they used to make those joints? Maybe a selective solder nozzle? ..but C4 is right next to it. If they used a wave solder on that side of the board, I think they would have needed to stick all those components down with adhesive, no? Post in the comments if you have any ideas how/why they did it this way! The digital daughterboard holds the ears and brains of the bulb and is made to slightly higher tolerances, but it is still relatively big stuff to keep the process cheap. The board only has components on one side so was almost certainly reflowed. So what kind Bluetooth radio and SoC did GE go for on this super low price/high volume unit? You will have to wait for the upcoming digital teardown to find out! Q: How did you get for them for $10 each? A: You have to order a 4-bulb starter kit and use the discount code “Sleeptight”. Q: Will replacing all the bulbs in my house with fancy circadian solar cycle synced smart bulbs make me sleep like a baby and save me thousands of dollars a year on sleeping pills? Q: I just bought one and I can’t figure out how the hell to use it! Note that the App only works on iOS and there is no ETA for an Android App (or even indication that one will ever come). 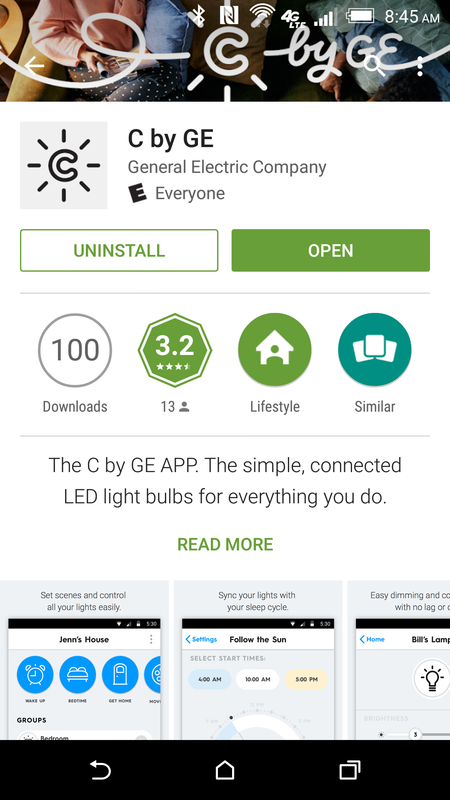 Once the app is installed, it is pretty straightforward to add a bulb by pressing “bulbs” then “add”. The App will search for any powered bulbs in range and pair with them. One bulb I tested seemed to crash after pairing, but unscrewing and rescrewing it seemed to fix it. A light bulb that crashes. I did notice that the App has a remote firmware upgrade, so maybe they can fix bugs like this. Note that once a bulb is paired, it will not pair again unless explicitly unpaired first. This makes sense from a security perspective since otherwise anyone in range could control the bulbs inside your house (and I can imagine bad ways that could play out). Unfortunately, this has the interesting downside that loosing your phone would seem to brick all your paired bulbs. If there is a way to physically reset a bulb, I don’t see it and I can not find any documentation for this bulb at all. Maybe there is a magic sequence of physically turning on and off that will make a bulb pair-able again? Please leave comments if you’ve figured it out! 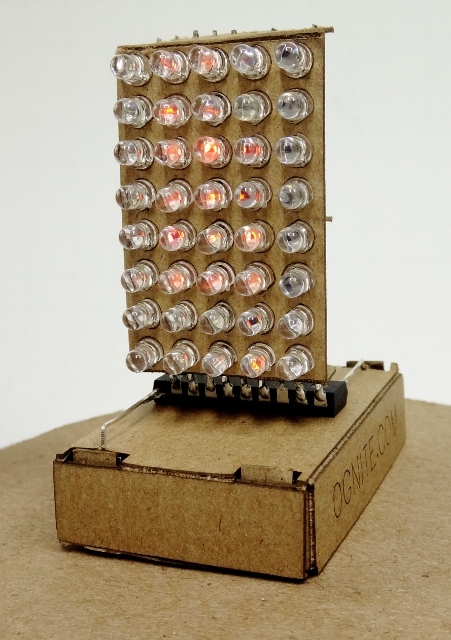 March 21, 2016 - 7:11 am Pingback: Inside the C-Sleep Lightbulb by @generalelectric #teardown « Adafruit Industries – Makers, hackers, artists, designers and engineers! They do have an Android app. Works great for me, but not for my wife. You can setup a login through the app to store your paired bulb profiles, and even share them with others. I feel that the app is really still in the testing phase. The biggest flaw I have with the hardware is that the bulb doesn’t seem to have a RTC, so your phone has to be in range at the set-point times to change it from AM->Day->Night. Otherwise you have to do it manually which nearly defeats the purpose for me. I knew there had to be a reset procedure, just couldn’t find it. I still can’t find the Android app in the Play Store. What did you search on? I was curious about that, since I couldn’t find it without being logged in. My wife was able to find it when we received our bulbs, so it’s not limited by e-mail or login. That board is indeed wave soldered. You can see the red glue dots from no-fit components on the bord. This was pretty much standard practice for boards until the (relatively) recent introduction of 100% SMT designs. Great job on the tear-down – I’d be intigued to find out how much of this could be re-purposed. Agreed! Those dots are a give-away. I guess it makes sense for this board since they needed the big though-hole capacitors and transformer on the top side, so soldering those header pins from the daughter-board was free. Great info! Sadly it looks like their website is down now, but I’ll keep cheeking because I want to read that datasheet! There is a simple way to reset the light bulb. Do three short on/off ( flip the switch on and off quickly, like off for a second then turn it back on) followed by three long on/off (off for 5 to 10 seconds then turn it back on). If you see the light bulb starts to blink, it’s back the the factory setting. I ordered two sets of these light bulbs. They are definitely solid and well built. Better than most of the LED light bulbs I could find at Home Depot. It’s a starter kit. I believe that’s how GE wanted to gain market shares. They work just like regular LED light bulb if you don’t have the iPhone. For $12-$13 each, they are actually a bargain, comparing to regular ones with roughly $10 – $20 each. I do wish GE will come out with a wall dimmer later on that can be used with these. And an Android app of course. There is an Android app. I bought 3 of the Sleep bulbs at Lowes for $5.98 each on clearance. They need a firmware update, or they will stop being visible to the app. The app will tell you and do it for you, but it may not tell you until you do a factory reset. Yes there is a method of turning the bulb on and off to rest it to factory. If you look on YouTube you will find it. You can also turn off then on the light to force it on without using the app. It also will sync to google home and Alexa more with the wifi hub. So then you can easily voice control them. The first article didn’t seem to interest many so never did the second. The power supply was pretty typical, but nicely designed with a big stepdown transformer and hearty caps. Magic sequence to Reset the bulb available. Should pair with Google Home without any Other Apps. Do you have the Firmware Image for one of These bulbs available? There are Other bulbs using the Same Hardware, but Not been able to pair with Google Home. Want to Swap the Firmware in These, but need an Image of the ge one’s. Why did Google declare war on HTTP?